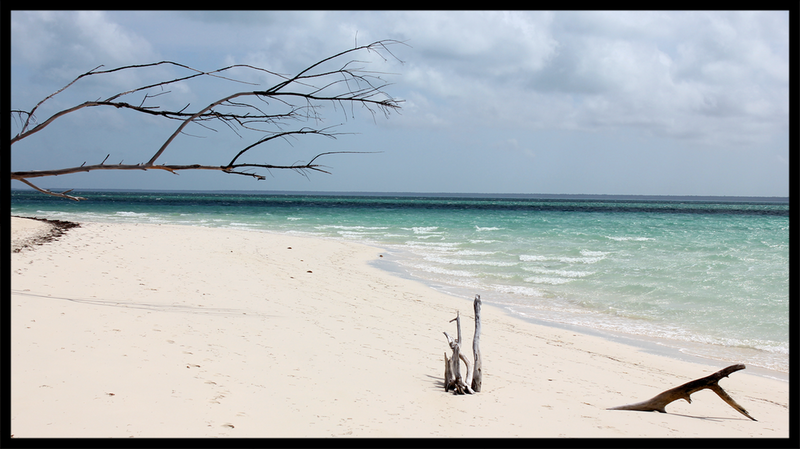 After taking fifty steps on the windswept west side of Munjack Cay I stopped abruptly and turned around. I saw that my footprints were the only ones on this side of the island. It made me smile to think that I was on a beach by myself, with nothing but the wind, the shhh-shhh of the choppy sea breaking on the sand, and the sound of my own breathing. There are still places like this, and they’re not that far away. Just the day before, my family and I had been sitting on another quiet beach. In the sheltered cove of Bita Bay, on the small island of Green Turtle Cay, we felt the same solitude and peace that only the sea and sky can deliver in just the right proportions. The special getaway package we had purchased to get to Green Turtle was labeled, When Turtles Fly. I had flown into the Bahamas only a few times, so this was all new to me, but I never expected to love tiny Green Turtle Cay as much as I did. We landed on Treasure Cay in the Abaco chain of the Bahamian islands on a clear and breezy March afternoon, took the ferry to Green Turtle Cay, and checked ourselves in at the Green Turtle Club. At the airport in Fort Lauderdale we met Mike and Jan, long time seasonal residents of Green Turtle, and on the ferry across the Sea of Abaco they shared history of their time on the island, as well as helpful advice to use during our stay. They invited us to come by their home, and the warm welcome they gave us had us all feeling like we had known them for years. The Green Turtle Club is comfortable and well run, the staff is exceedingly friendly, and the food and drinks are superb. Their version of a Goombay Smash, The Tipsy Turtle, is a rum-filled ambush of tropical flavors. While I drank my first one, I was warned by a fellow patron just a few barstools over about how sneaky my possible second round would be. What a place to be cautious, though. The cozy bar at the Green Turtle Club, with its heavy beams covered in signed dollar bills and hanging nautical flags, is something like sitting in the captain’s quarters of an old ship. You can just imagine the tall stories that drifted through that room over the years; Tales of huge fish that got away, narrow escapes from waterspouts at sea, and little-known island channels that lead to secret fishing spots. Hemingway would have loved it. Home to the friendliest people I have ever met anywhere, Green Turtle Cay is only about three miles long and a mile wide. Gas powered golf carts are the main mode of transportation, and our little cart helped us see just about every part of that island in the four days we were there, even if it did struggle up some of the hills. We made numerous trips into New Plymouth, the downtown area, and we won’t soon forget the smiles and warmth of the residents of Green Turtle Cay. We also explored every beach we could get to. 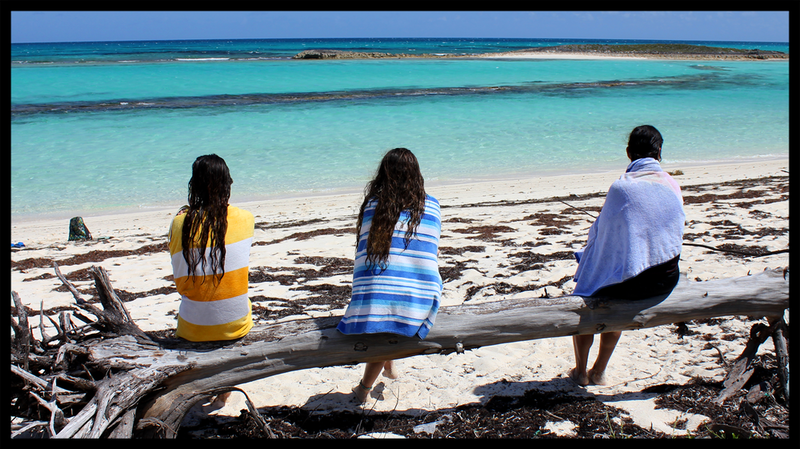 Quiet beautiful beaches are everywhere on Green Turtle and all of them are public. It was easy to find some we liked, but wasn’t easy to see any people around. That was just fine with us. 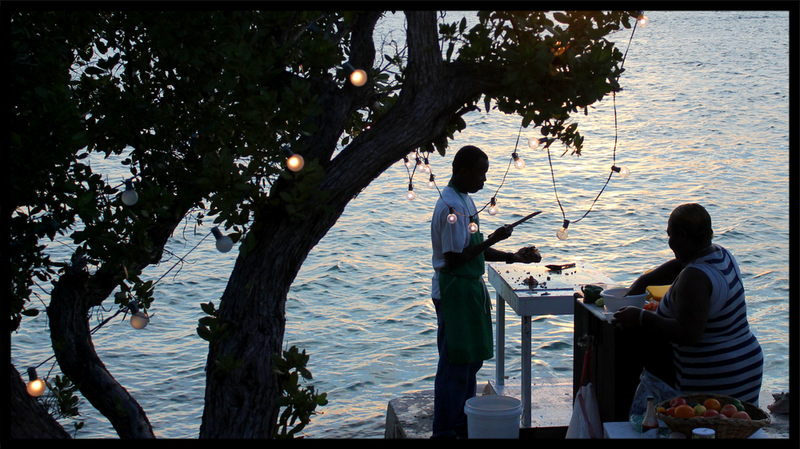 As with any Bahamian island, the surrounding water is its pantry and conch is an essential staple. You can see the piles of conch shells everywhere, and Bahamians are experts at removing the conch without damaging the shell too much. Fresh Queen Conch, cracked and deep-fried or as ceviche, is something you must experience at least once in your lifetime. I have never had conch here in Florida that even remotely compares to that which you can get in the islands. (Conch is protected in Florida waters, but not in the Bahamas, so here they’re imported and not as fresh). Take some fresh cracked conch, add hot sauce and a cold Kalik (Bahamian beer), and you have a meal as complete as you might ever need in life. Back on the windswept beach of Munjack Cay, I loosely retraced my footprints back around to the protected cove to join the rest of my party. My brief dose of solitude was refreshing, but I wasn’t alone by any means. There were nine of us who had arrived on this little island, all part of a day charter with Lincoln Jones and his son Marcus, both native to Green Turtle. 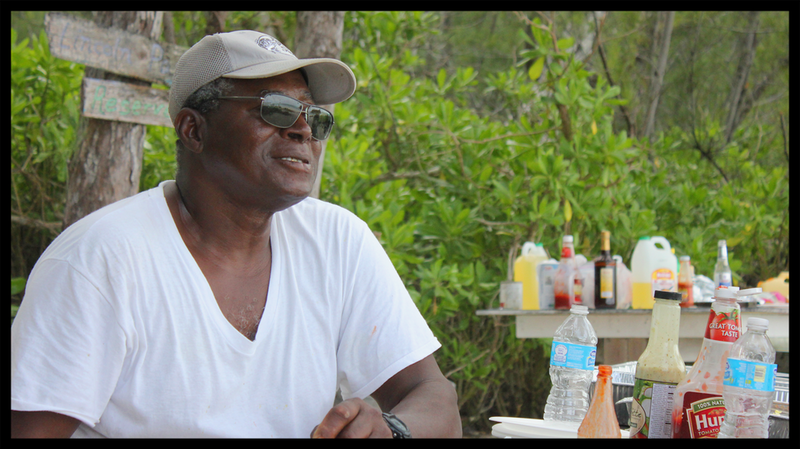 Lincoln Jones takes visiting tourists on an excursion to what he calls Lincoln Park, his own reserved and private section of Munjack Cay. It was at Lincoln Park that we ate some of the most delicious food we have ever had— after spending the first part of the day helping to catch it. I’ve hunted lobster before and have gotten used to the places they like to park themselves, sometimes in groups, so I started searching, armed with nothing but gloves and a GoPro camera. Marcus went off in search too, but with a spear, and after a few minutes I called him over to a couple of submerged logs where I had located a small cluster of spiny lobster (bugs). Marcus dove down and began spearing them one after another, sometimes coming up with three at a time to hand them up into the boat. He was calm and methodical and spoke very little. This trip, after all, was a workday for him and his father, and the lunch reservation at Lincoln Park was for a party of eleven. There was no time for sightseeing, as they would need a lot more food than a few lobsters. They did let us explore a bit longer, though. I went off looking for more lobster in one direction and found some great sections of shallow reef. Marcus went off in another, but soon I was called back on board. It was time to fish. 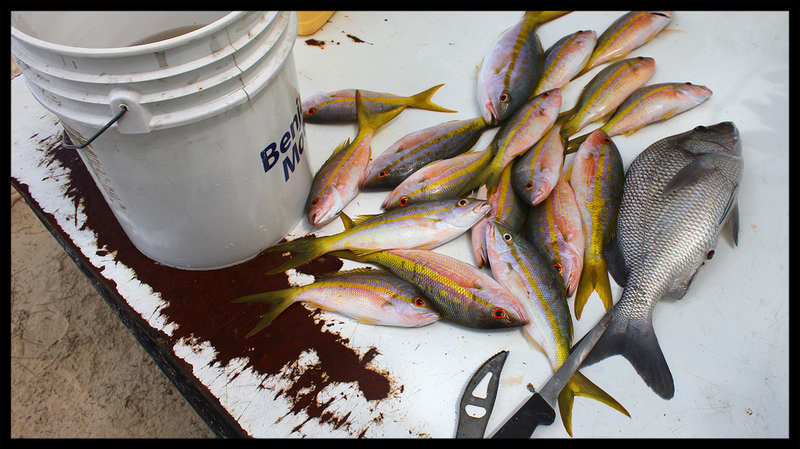 After a quick run out into a deeper channel, baited lines went in the water and in no time at all fish began to fill a five-gallon paint bucket. We were invited to fish if we wanted, so I grabbed a pole, which Marcus quickly baited for me, and tossed the line over the side. It didn’t take long before I felt a tug on the line, and enthusiastically jerked the pole up to set the hook. The pole snapped in half. Marcus urged me to keep reeling the fish in even with it broken, and when I got it aboard, saw that my catch was only about as big as my hand. Marcus looked at me and said, deadpan, “That’s a strong little fish.” I laughed out loud. Island humor is sometimes at the expense of the tourist. When Lincoln thought he had caught enough fish and had given us enough exposure to the choppy sea, the anchor came up and we raced around the corner into Munjack’s protected cove. 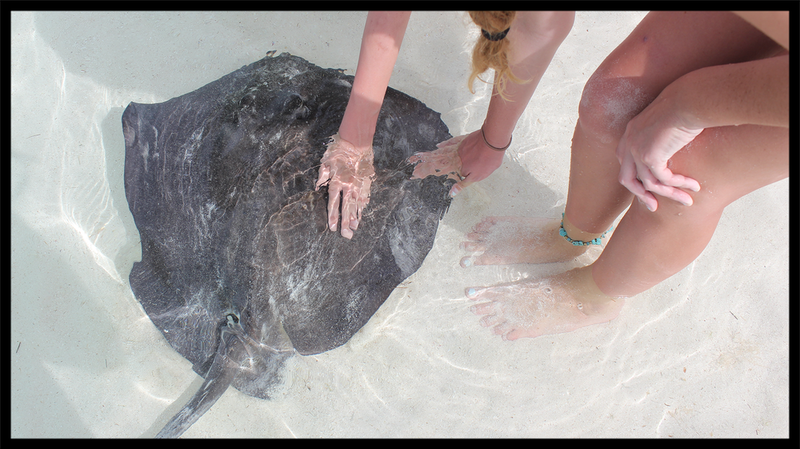 Almost immediately, as we coasted onto shore, a few small sharks and some stingrays cruised in. Used to being fed, they were waiting for Lincoln to toss out whatever was left from our fish fry lunch, so they hung around, patiently swimming wide circles over the white sandy bottom. Lincoln beached the boat and without hesitation, marched up the beach to a picnic table under the trees. Then he and Marcus built a fire, cleaned and breaded the fish and lobster, cut potatoes, and mixed up rum punch for us to drink while we waited. When the oil in the cast iron skillet was hot enough, the seasoned sliced potatoes went in. The combined smells of cooking food and salt air had a narcotic effect on us. (Or was that the rum punch). The smoke from the fire went up, the wind above us blew through the Australian pines and the tide slowly changed under a brilliant blue sky. Lincoln Park has a small magic all its own. After lunch, we all stood in the shallow water as Lincoln tossed scraps from the fish to the sharks and rays. It was a well-practiced part of the day’s adventure. The sharks’ circling movements became rapid, blurry, angular attacks as they thrashed just a few feet away from us. The rays were unaffected by the small frenzy and came cruising by like little vacuum cleaners for the tiny pieces the sharks missed. When all the scraps were gone, the sharks and rays were making slow circles again, seemingly oblivious to one another. A small green sea turtle swam in carefully from over the grass, flying over the sand with a trail of fish behind it. Lincoln held a scrap underwater, trying to tempt the turtle closer. It hesitated, swam away, and then slowly came back. When the little turtle was as close as he felt it would get, Lincoln let the scrap go, and the turtle ate it from a few inches away. I was standing in the boat with my camera as Lincoln looked up and said with a broad smile, “A couple more weeks and I’ll have him eating right from my hand.” We were witnesses to more magic at Lincoln Park. We spent our last day on Green Turtle exploring beaches again, trying not to think about the unavoidable end of our trip, but of course, the day went by quickly in spite of us. Why is it that the end of a vacation always speeds up like that, no matter what you do to slow it down? This is something I already assumed to be true.